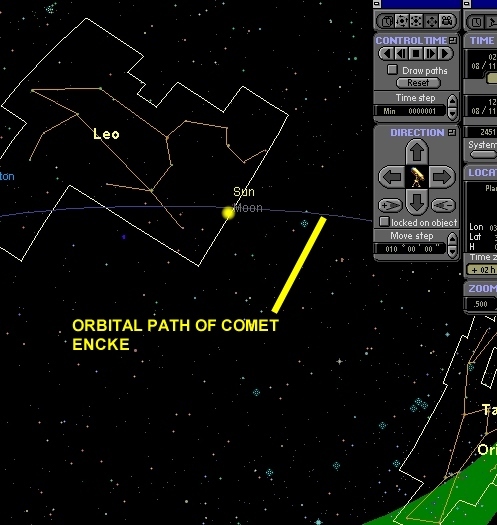 Comet Encke 2p Perhelion was May 23rd Closest to Earth June/July Mag 6.
a rate of 20,000 per hour. won't be until November, 1999." Most favored areas: Eastern Atlantic, Europe, Africa, Asia. Astronomer Fred Whipple calculates that the night time Taurids have been with us for 5,000 years. It now takes Earth about three months (mid-September to mid-December) to traverse this band of debris. The night-time Taurids branch into two radiants. One branch appears to radiate from near the Pleiades star cluster and peaks around November 3 to 5. The second branch seems to spray from close to the Hyades and is most active from November 10 to 13. Earlier in its history, as the progenitor of comet Encke was creating it, this debris ring had to have been more dense. As Earth passed through the mess, it no doubt collected a considerable amount of dust. The night time Taurids are known for frequent bolide activity. Large, vaporizing meteoroids (bolides) in an atmosphere loaded with comet dust will produce unusual visual effects. Refraction, reflection, and possibly secondary emission come into play as a sizable object splashes into an aerosol laden atmosphere compressing molecules of gas against motes of dust in its bow-shock wave until--BOOM-(Occured Nov. 1963) -the object vaporizes, illuminating the multiple layers of compression separated gas and debris. From the ground this might look as if a god threw a pebble in the sky-pond. Velikovsky saw "Comet Venus." As a researcher he fell victim to what is called the"bibbu boo-boo." There is considerable reason to suspect that the majority of our planet's namesakes were comets--probably of the Encke family. "The word planet comes from the Greek planetes, the wanderers; these seven celestial bodies moved among the fixed stars. The Babylonians had a more picturesque name bibbu, the wild sheep, as these bodies broke through the fixed formation in which the tame sheep crossed the sky." "As we first outlined in Oh My God, They Killed SOHO!, the Taurid stream is highly dangerous, possessing some 300,000 "planet killer" sized objects. We also pass through this stream, generated by the trailing debris of Comet Encke, bi-annually, in June/July and November. It is also the source of "chaos and evil" in the Egyptian myths, through it's association with the constellation Taurus and the god Set. NASA has been increasingly focused on this particular comet and meteor shower over the years, even naming its "Comet Home Page" after the Comet Encke. As we predicted then, the chances of an impact from this stream seem to be increasing at a rate analogous to NASA's comet fixation. And ,as Enterprise principal investigator Richard Hoagland predicted in an appearance on Art Bell's show a few weeks back, we now have the first potential confirmation that there is indeed an object of concern in the Taurid stream. Whether it will hit us, and in which of the passings that might be, we do not yet know. What is now clear, if the video is taken at face value, is that our interest in NASA's interest in Encke and the Taurid's was well founded. And that is not very good news." Comets are small lumps of rock and ice which orbit the Sun. They are thought to be the oldest objects in the solar system, remnants of the nebula from which the planets formed 4.5 billion years ago. They are perhaps a few miles across and have been best described as large "dirty snowballs" by the astronomer Fred Whipple. The bright head and tail of a comet, are formed by gas and dust evaporated from the comet and can only be seen when a comet enters the inner solar system and is warmed by the Sun. In 1950, Dutch Astronomer Jan Oort proposed that a large, spherical cloud of comets surrounds the solar system. The Oort Cloud is supposed to be almost 1 light year in radius and could contain up to a trillion small, icy comets. It has never been observed, only theorised, but its existence would explain the orbits of the long period comets, which return to the inner solar system once every million or ten million years. The Oort Cloud does not explain the existence of comets which have orbital periods of 200 years or less. In 1951, astronomer Gerald Kuiper suggested that another belt of comets existed beyond the orbit of Neptune, between 30 and 50 astronomical units (4.5 to 7.5 thousand million km) from the Sun. In 1988, a group of astronomers at the University of Hawaii and the University of California at Berkeley began searching for Kuiper Belt objects using a 2.2m telescope in Hawaii. They discovered the first Kuiper Belt object in 1992. Subsequent observations from Hawaii and with the Hubble Space Telescope have discovered dozens of icy objects, each a few hundred km in size and with orbital periods of a few hundred years. The European Space Agency space probe Giotto gave us our first ever view of a comet's nucleus when it passed within 600 km of the nucleus of Halley's Comet in 1986. We now know that the nucleus is small, about 10-20 kilometres across, is irregular in shape (rather like a peanut), and is almost black. From it jets of gas and dust are forced out by the Sun's radiation. We believe that under the black skin there is a solid body composed of ices of various kinds, including water-ice, dry-ice (made of carbon dioxide), ammonia, methane and many other organic carbon compound ices all mixed together with dust. The dust contains silicates, carbon and carbon compounds. Surrounding the nucleus is the bright coma. This can be very large (the coma of the Great Comet of 1811 was as large as the Sun) and is composed of gas and dust which has been expelled from the nucleus as sunlight evaporates ices in the nucleus. The expelled gas and dust form a roughly spherical ball around the nucleus. The action of the Sun's radiation and the magnetic field associated with the solar wind remove gas and dust from the coma and it is `blown' away to form the comet's tail. The gas which is blown away from the coma is ionised by solar radiation and is affected strongly by the magnetic fields associated with the solar wind . The gas tail glows because atoms of the gas absorb and then re-emit light from the Sun. This gives the gas tail its characteristic blue colour. The shape of the tail is governed by magnetic structures in the solar wind but predominantly the gas tail points directly away from the Sun. 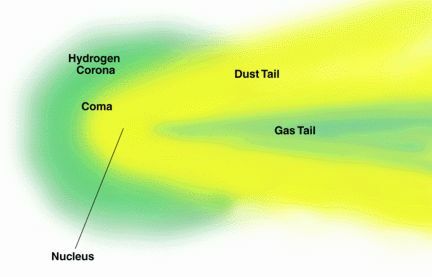 Dust which is blown away from the coma absorbs sunlight and is pushed away from the coma, forming a seperate tail from the gas tail.. The dust tail can be complex, multiple and even curved but, in general, will point away from the Sun. Sometimes, due to projection effects, part of the dust tail can be seen pointing in a sunward direction. This is just due to the fact that the comet and the Earth are moving and that part of the tail has been `left behind' in such a place as to appear to point towards the Sun. The dust tail is yellow because it reflects the Sun's light to us. Over the next few weeks the Taurid stream, a procession of vast cosmic rubble and dust that snakes around the Sun and out towards Jupiter, will swing through Earth's orbit for the first of its bi-annual crossings. Within the stream are probably thousands of bodies including asteroids, mountain-and island-sized boulders, smaller meteoroids, Encke's Comet and assorted fragments of celestial refuse. The exact number, size and location of objects, however, remains a mystery and according to Dr. Mark Bailey, research Fellow in astronomy at Manchester University, it is likely that for every object which is confirmed, there are nine others that have so far eluded detection. All that is certain is that the rubble, believed by some astronomers to have been formed by a collision in the asteroid belt of a defunct comet which was captured by the solar system up to 30,000 thousand years ago, will bisect Earth's orbit in late June and again in November. According to astronomers such as Dr. Victor Clube, of Oxford University's Department of Astrophysics, the coming and goings of the Taurid stream should be a source of concern to politicians, planners and anyone who cherishes life on Earth. A ''catastrophist'', Dr. Clube is one of many astronomers who are convinced that within this celestial procession lie the seeds of mass destruction an Armageddon of biblical proportions. ''The matter requires urgent attention. It is crucial that everyone is woken up to the danger,'' Dr. Clube says. The chilling scenario envisaged is of Earth and one of the 46,000mph objects in the Taurid stream colliding during one of the orbital crossings. He has coined the phrase ''Multiple Tunguska Bombardment'' to describe the worst nightmare which, he believes, will eventually happen. Tunguska refers to a Siberian River near which, in June 1908, a 100 yard body from the Taurid stream ploughed into Earth, exploding and devastating an area 25 miles wide with the impact of a 20-megaton bomb. Fortunately the encounter occured in an unpopulated part of the globe but if the impact had been on London it would have devastated the city, killing millions. The Tunguska event may have been only a chance occurence. Yet, according to Dr. Clube and Dr. Bill Napier, of the Royal Observatory in Edinburgh, whose book Cosmic Winter is published next month, the history of Earth is littered with subtle evidence that cosmic debris have consistently intervened, often with catastrophic consequences. One of the most popular theories to explain the sudden demise of the dinosaurs is that, 65 million years ago, a huge asteroid ploughed into the planet, triggering either a nuclear-style winter or huge fires. This popular theory was given a boost only last week when scientists at the University of Arizona reported the discovery of an apparent 180-mile-wide crash site in the Caribbean of an asteroid six miles wide. They claim this could be linked with the great reptiles' extinction. Dr. Clube ascribes other events including the Old Testament story of Noah and his Ark to a Dark Age linked with colliding heavenly bodies. He also believes that climatic changes, including fears of present global warming, may have a cosmic component. There is sufficient evidence, he says, to indicate that collisions happen within centuries and millenniums rather than millions and billions of years, with multiple encounters more likely than sceptics claim. Dr. Clube emphasizes that predicting when a bombardment may occur is impossible without more scientific evaluation of the Taurid stream. ''We are probably a little safer at the moment because the intersecting orbits are far away. But we are on the inward run and in 500 years we will start getting close again,'' he says. According to Dr. Clube, the last time that the stream was closest within Earth's orbit was in the first millennium BC, from about 500BC up to 0AD, the time of Christ. It is vital to overcome complacency about the threat from cosmic debris, he says. This complacency is relatively new, as pagan and ancient civilisations such as the Babylonians were firm believers in the threat of of cosmic destruction. Part of the blame for this complacency rests with the breakup, in 1845, of Comet Biela without any easily visible effect on Earth. 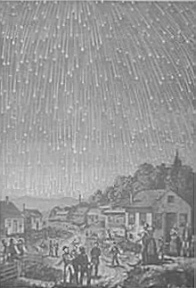 ''This rather relaxed attiude to comets, which has persisted to the present day, helped turn 19th century opinion against a prevailing catastrophist view of evolution,'' Dr. Clube says. The Oxford astrophysicist is not alone in his views. Similar concerns were echoed last week by the respected American Institute of Aeronautics and Astronautics (AIAA). The institute is calling for studies aimed at defending the Earth from asteroid attack, including the possible redeployment of nuclear weapons to shatter incoming celestial bodies. The call comes in the wake of thawing East-West relations and what is being claimed as a recent, potentially disastrous near-collision. Last year, 1989 FC, a cosmic boulder bigger than an aircraft carrier, passed within 400,000 miles of Earth, a mere whisker in astronomical terms, before being noticed by astronomers. ''Such an object could cause a disaster of unprecedented proportions if it had struck. Although the probability is very small, its consequences in terms of the casuality rate could be enormous,'' the institute argues in a paper it released about the problem. Apart from putting nuclear warheads on standby for intercepting and shattering asteroids, the institute is calling for studies into power units that could attach and divert the celestial boulders away from Earth. ''We have the technology needed to detect and track such an object and possibly to divert if from an impending impact. We would be derelict if we did nothing,'' the institute says. Dr. Clube is hoping to get access to an infra-red telescope to study the Taurid stream during the November crossover. In 1983, a satellite revealed what appeared to be dust following Comet Encke, but some scientists, including Dr. Clube, now believe that this contains the single large missing body, perhaps as large as 20 miles wide, shrouded in dust and boulders. The best chance of detecting the defunct comet might come in 1994 when the American National Aeronautics and Space Administration (Nasa) is expected to launch the infra-red telescope, ISO. Along with Dr. Bailey, Dr. Clube supports the institute's call for improved monitoring. But both British astronomers are concerned at suggestions of shattering incoming asteroids. They believe that there is the danger that by solving one large threat, it may create scores of smaller ones. Cosmic Winter by Dr. Victor Clube and Dr. Bill Napier. Published in June by Basil Blackwell (Pounds 16.95). The Origin of Comets by Dr. Mark Bailey, Dr. Victor Clube and Dr. Bill Napier. Pergamon Press. Before The Stones: Stonehenge I As A Cometary Catastrophe Predictor?